Artwork Panel: 43.6cm x 67cm ≈ 17¼" x 26¼"
Silk/Brocade: 53cm x 122cm ≈ 20¾" x 48"
Woodblock printing is a process, where dye or paint is applied to a carefully carved wooden block or plate. Paper is then placed on the prepared block and a roller is applied to the paper to ensure the dye or paint transfers properly and evenly on the paper. The woodblock printing process is only for the black lines of the image. The artist later applies colorful paint to the piece to finish it off. 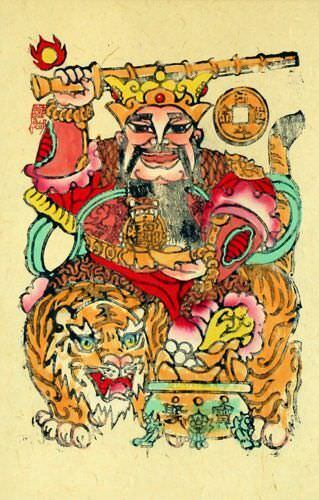 The art of woodblock printing spans nearly 1,800 years of Chinese history. 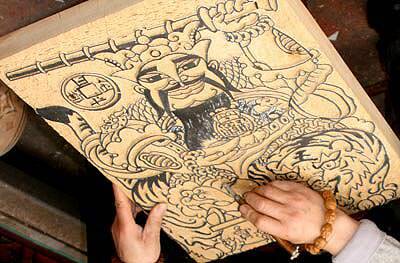 The carving (xylography) and printing process has remained the same since that ancient time. 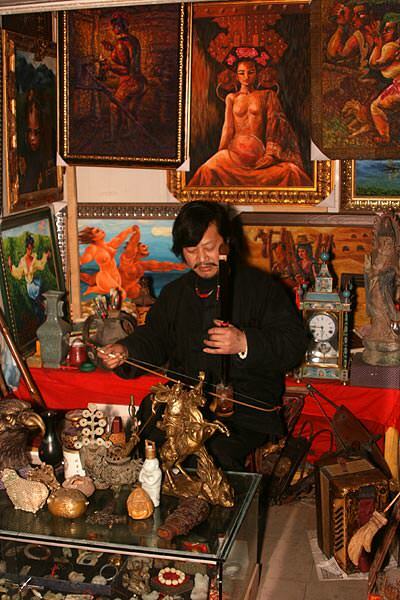 2004 Tang Zhong-Lin plays the erhu (an ancient two-stringed Chinese violin) at his shop in Chengdu. 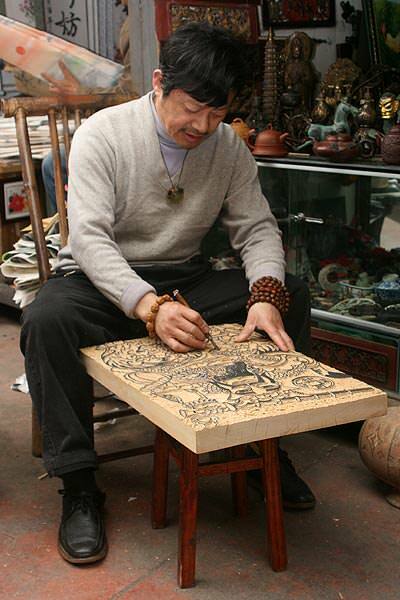 2008 I discover Mr. Tang carving a woodblock print plate out of solid birch. About once a year for the past 7 years, I make a trip to Chengdu in the Sichuan province of China (that's where the pandas live). Each time, I visit Huang Xin-An (one of my favorite artists). In the tiny shop next to Huang Xin-An's is a very quiet, and yet eccentric man. 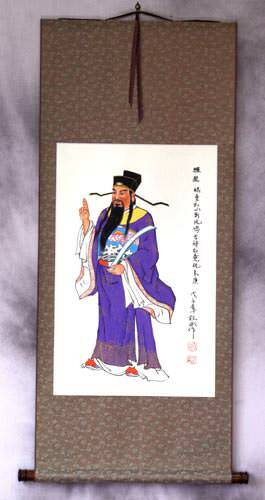 His name is Tang Zhong-Lin (Mr. Tang). His shop is like a collection of curiosities. 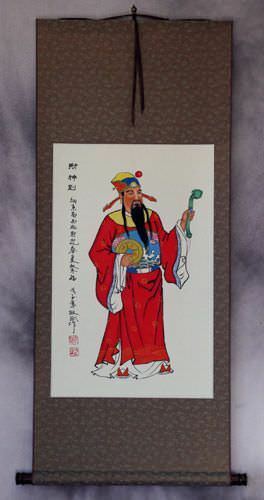 He has rare trinkets and antiques from rare places and times in China. From time to time, I buy one of those trinkets for personal use, or as a gift for a close friend. One year, some oil paintings appeared in his shop. I ask Mr. Tang about them, and he told me that he painted them. The images are dark; Not just the colors, but the subject as well. One appears to be an angel in hell. I ask the price, but they are out of my price range. More than a year later, I am back in Chengdu. After buying a couple hundred watercolor paintings from Huang Xin-An (a year's supply), I see Mr. Tang slowly working with a scribe and chisel on a huge block of hardwood. I ask what he's working on, and without a word, he flips the wood over. Suddenly, I know just what it is. He's carving the plate for a woodblock print. 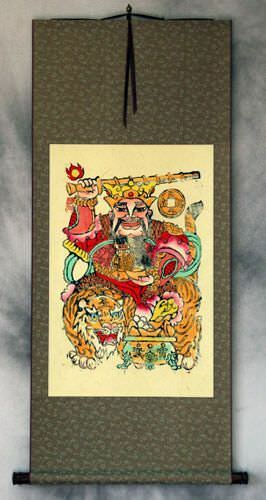 I then talk to Mr. Tang at length about how I tried to buy woodblock prints before, but the colors always bled when we tried to mount them to wall scrolls. Mr. Tang says this was because most woodblock prints are made to be pasted by people's doors and forgotten about. They're not made to last. Then he says he'll make me some quality woodblock prints that are made to last. With the use of quality paints, he assures me that there will be no bleeding of the colors when we mount the artwork. I specify that I want them done on handmade "picaozhi" (so-called "leather grass paper"). He likes my paper choice for his artwork, and we strike a deal. I pile a hefty sum of money into Mr. Tang's hands and continue my journey. A few months later, a package full of very cool woodblock prints arrived at my family apartment in Beijing. They look great. They've been mounted to handmade wall scrolls at our workshop. Now you can hang this rare artwork of ancient technique and origin in your home. 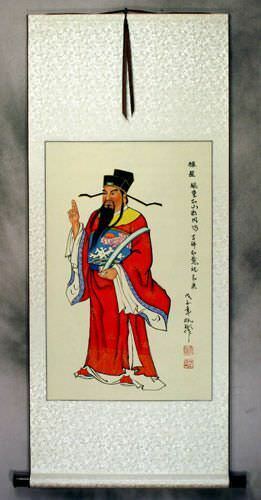 This woodblock print is of a higher quality than you would normally find. It's made to last a lifetime. 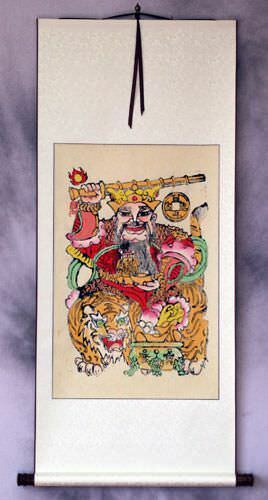 All carving and Chinese character must be created in mirror image of the final product. Time for a smile during the carving. There's no rush, as it takes weeks to carve both sides of the block. 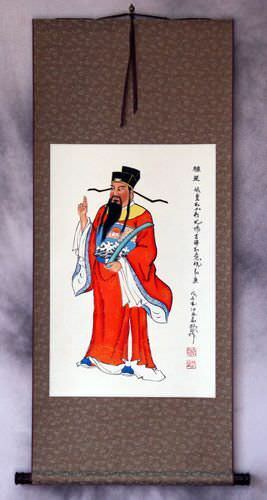 Tang Zhong-Lin is in his late 40s. When describing himself, he seems proud of his rather round eyes (at least more round than most Chinese people). He is a collector and dealer of many unique items. In his shop you'll find antique incense burners, bronze Buddha heads, antique door locks, and much more. Buying and selling these items is how he makes his living, but he also has an artistic streak. He's been having trouble finding a market for his somewhat morbid and abstract oil paintings in China (we're still thinking about helping him find a market in the west). 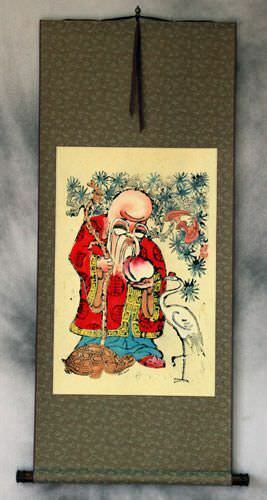 His love of classic Chinese subjects, has led him to master the art of woodblock printing. 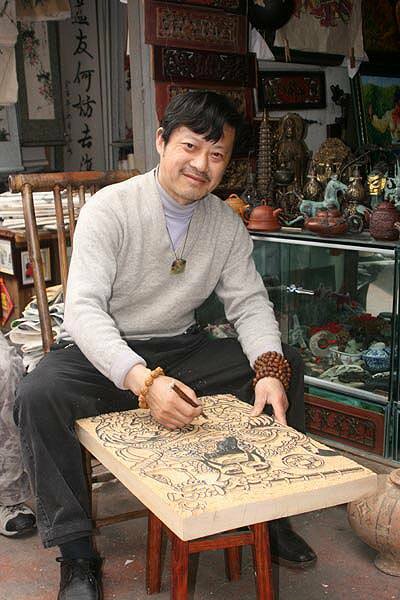 Next time you're at the arts and antiques market in Chengdu, maybe you'll run across Mr. Tang carving on another block of wood, or putting the finishing touches on an oil painting.